For any retail investor looking at technology opportunities, identifying just where various technologies are in their respective development (how much work is still to be done to bring the ideas to fruition) and, as such, when each of them will become realities, is imperative. Our Hype Cycle graph does just that. Take a look. The above introductory comments are edited excerpts from an article* by Jeff Desjardins (VisualCapitalist.com) entitled Technology Hype Cycles. The following article is presented courtesy of Lorimer Wilson, editor of www.munKNEE.com (Your Key to Making Money! ), and www.FinancialArticleSummariesToday.com (A site for sore eyes and inquisitive minds) and has been edited, abridged and/or reformatted (some sub-titles and bold/italics emphases) for the sake of clarity and brevity to ensure a fast and easy read. This paragraph must be included in any article re-posting to avoid copyright infringement. Hype occurs in cycles…[and] every year Gartner publishes a great resource called the Technology Hype Cycle [which evaluates the market promotion and perception of value for over 2,000 technologies, services and trends in 119 areas exploring the impact of the megatrends affecting Hype Cycles and profiles across all research areas]. 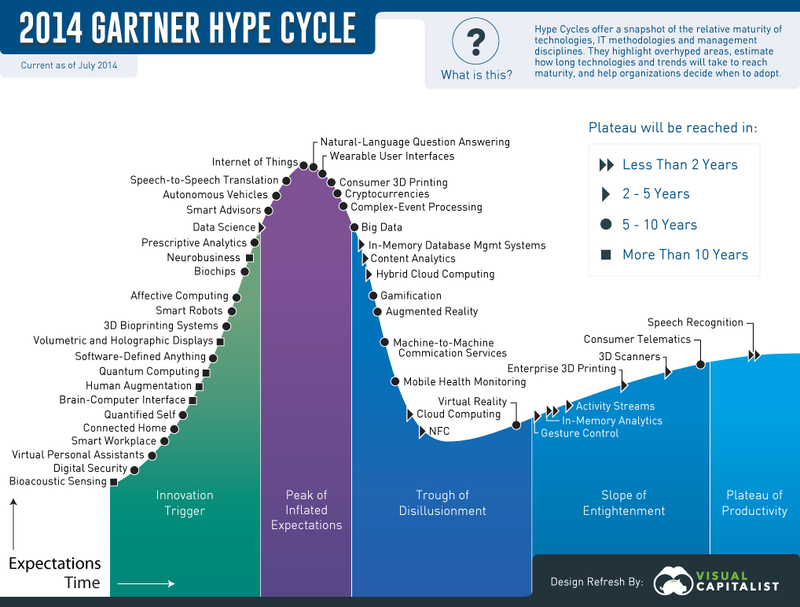 Below we have done a re-design of Gartner’s Hype Cycle [related to new technologies] by taking all the broad concepts in technology and plotting them along a typical plot that shows expectations over time. For any retail investor looking at technology opportunities, taking this into consideration is imperative. What Is – Why Invest In – the New “Internet of Things” (IoT) Market? to keep you on the forefront of innovation. Identify a broad category of technology as it comes as an innovation trigger, and find early stage investments to ride the increasing expectations. Identify companies that are on the way to successfully realizing the potential of technologies that are new but where the shine has worn off, [such as] enterprise 3d printing, virtual reality, and cloud computing. Virtual reality, as an example, was cool around 15 years ago but people have forgotten about it. [Today,] however, there are companies that are on the verge of revolutionizing the field and it will be in the news again soon. “Follow the munKNEE” & Get Every Article! 1. What Is – Why Invest In – the New “Internet of Things” (IoT) Market? 11. Which Has More Upside: Bitcoin or Gold? 13. Bitcoin Will Trade for Under $10 by June 30, 2014! 17. Bitcoin vs. the U.S. Dollar – No Contest – Ever! 18. What Are P2P Currencies (Bitcoin & Litecoin)? Should We Get Some? 19. Is Popularity of Bitcoins Adversely Affecting Price of Gold?